THE LABOUR RELATIONS Commission talks between Aer Lingus and staff represented by IMPACT over plans to close a cabin crew base at Shannon Airport, adjourned this evening. 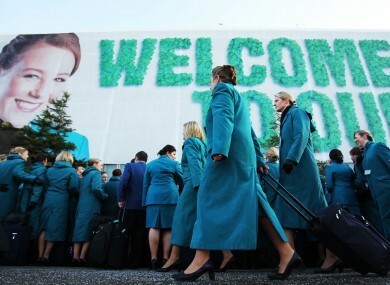 The cabin crew base at the airport employs 87 people. In a statement from IMPACT it was confirmed that the talks will reconvene at 12pm tomorrow. It was announced on Tuesday that talks between the parties would convene at the LRC, with the commission stating that the meeting will centre solely around the plans to close the cabin crew base in Shannon and not Monday’s ballot results for industrial action. At the request of the LRC, IMPACT said it would not be making any further comments on the talks at this time. Email “LRC talks between IMPACT cabin crew and Aer Lingus adjourned”. Feedback on “LRC talks between IMPACT cabin crew and Aer Lingus adjourned”.